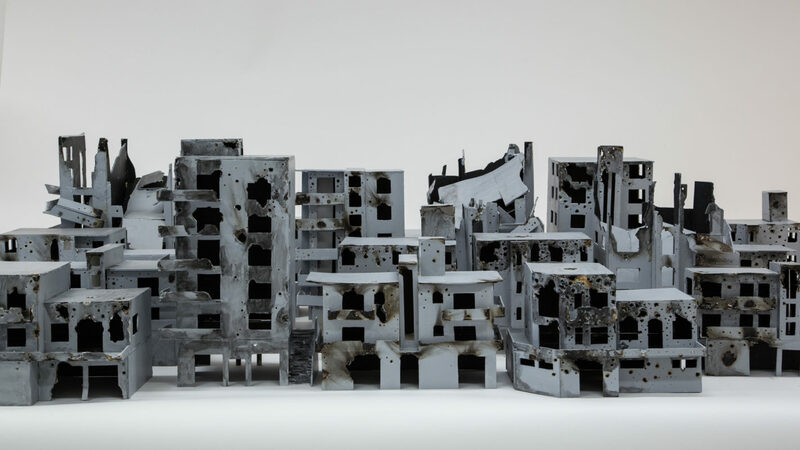 During those troubled times, it seemed to us essential to offer another vision of Syria through its culture and the artistic creation of its artists. Jasmine, Another Syria was born from the meeting of people from different horizons and cultures: French, Franco-Syrians and Syrians wishing to show their solidarity with Syria and its people. The focus will be given on the artistic works of Syrian artists, the history of Syria (and its links with France), its literature and poetry, its cultural diversity and wealth. Jasmine, Another Syria is meant to build a bridge between two languages, two cultures, two worlds. This magazine with independent and non-profit funding will be published on a quarterly basis online on our Website syriaartasso.com, and annually as a print edition. It will be edited partially in French and in English languages. luminous cells bathed in the meshwork of colors, where the light breaks up and disperses to reorganize itself, as if it were a weave of mists, traversed by the rays of a mysterious sun. This is all that I feel and see, in a flood of contradictions, when I look at Marwan’s paintings. Indeed, it seems to me that Marwan wants to trace the existence back into its first earthly creative form and life into its first embryonic pulse. Or as someone who wants to stir the color and shake it up to transform it into creatures whose only shadows are seen. and formed by the metaphor of art. as if the visible were exactly what we do not see. October 22, Marwan Kassab-Bachi, the Syria-born Berlin-based painter, passed away in the German capital at the age of 82. Better known as Marwan, the artist was esteemed for his loosely figurative paintings that were simultaneously Arabic and Western-European in style, reflecting the confusion of identity of those who found themselves among a cultural diaspora after World War II. He particularly drew inspiration from the expressionist works of Chaïm Soutine and European artists whose works were exhibited in the Louvre, which guided his own experiments of using color to build forms of human features and body parts. What do women from the Middle East aspire to? In their homeland or host country, where do their dreams begin and how strong is their capacity to embrace hope? The Orient of dreams and blood, the Orient of glory and torments, what traces has it left on their souls? The Woman has always been the soul and heart of the Levant, and the origin of its radiance. From goddesses to queens, poets to artists, and even the language itself, the eternal feminine is a source of creativity that has long inspired men and influenced the destiny of this region, which was once the centre of another world. Today, in those times of war and instability, Oriental women do not remain in the shadow, their voices break the silence and their calls are heard. Faithful to centuries of the most beautiful human expression, feminine emotions take a new flight. These materialize in works of art thus proving the common identity of Humanity, while leaving their singular footprints with the scent of jasmine and the colours of the Levant. Shereen, Cham and Rana, three young women of our Orient, whose fate guided by life choices led to Canada. They found in art a horizon to release their feelings, to express their femininity, to draw the lines of their joys and sorrows, to sculpt their human concerns and to paint life in the colours of hope. Shereen Audi expresses her feelings in a dreamy fantasy. If at first sight the work of the artist reveals a joyous atmosphere in an enchanted parallel world, a deeper look reveals a true search for feminine identity, between the image that some misogynistic societies are trying to impose on the existence of women and the reality of what women yearn for and often struggle to achieve. The wings are recurrent elements in Shereen’s work; this is how she expresses her will, and the will of her generation, to take flight with her own wings, to leave the imposed framework, to refuse to be under tutelage and to affirm her femininity as a creative force. Cham Chahda’s primary concern is the human being, his fragility, both his ability to create beauty and his propensity to destruction. At first sight, Cham’s sculpture is figurative, but by delving into the details we realize the depth of her thought: What makes us a human being in the 21st century? How does material life affect the deepest part of our existence? Our attachment to the things around us, our desire of possession, what remains of us and of those who crossed our path, the haunting memories of a country devastated by human ignorance; what remains, those who remain and all that has gone for ever, except in the soul where there are indelible traces of presence and absence, and steps taken on the path of life. Freedom is the central theme reflected in Rana Hatmal’s paintings, the steps we take during our life, what guides us and what hinders or propels our flight. If the artist relies on her roots to draw paths in different shades of colours, she has a concern about the future, yet it is the present that matters the most. To break the chains and give free will to our senses, our emotions and gestures, we need the freedom in which our souls flourish. We could be like birds in flight, free to explore, free to point and draw. What counts is not so much the horizon or the end of the road, but above all the freedom of movement, a freedom so dear, but increasingly restricted, in a world that, in its frightening acceleration, leaves no more room to savour the present. Here are brought together fragments of life of these young artists coming from a distant country, and who continue to demonstrate their ability to renew, create and question the world around them, from their place of residence in Montreal. It is through their Art that their dreams take shape, and in their own hands they allow their hopes and their femininity triumph. Shereen’s work is highly personal depicting her ‘inner self’, yet eschews profound reflections on the Middle East for something more callous; a critique of twenty first century reality, an enthusiastic negation of all that we are and all that we feel, and a retreat into the chains of a soothing forgetful escapism. Shereen’s art reveals as well a range of universal emotions and concerns that are inherent to the female identity, her presence and her voice that should be heard. Fairy wings and cell bars, women blind folded, beheaded and tied down, represent materialism and consumerism, and at the same time make an emotional plea to be free. At other times her work celebrates happiness in times of hardship, and child-like simplicity over sophistication. Her exploration of new Medias including video art and photography in 2014 received a lot of praise and appreciation from art viewers, and her “Soul’s Flight” short video was presented in Europe at different events. Shereen lives and works in Montreal, Canada. Her art is housed in many private collections as well as in public collections including Jordan National Gallery of Fine arts. She has held many solo exhibitions and has participated in a number of group shows in the Middle East, Europe and Asia including Germany, Japan, Romania, Finland, Bahrain, Lebanon, Algeria, Egypt and Jordan. Art is my lifetime passion, the way I express myself, a world I have created for my mind and my soul. Through art I express my inner self that is affected by external daily life events. My art is highly personal but reveals a range of universal emotions and concerns that are inherent to the female identity, her presence and her voice that should be heard. My art is my relief, my runaway from reality to a world of fantasy. My art is my strength, my satisfaction and my self confidence. My art is the stemming beauty coming out from my inner self expressions, and of which I present to the whole world. I made my latest collages to celebrate confidant capable strong women. In my opinion women are capable, strong and can face any kind of difficulties or hardships they face in their lives. I believe in women in general. In these works I want to give women good energy, good vibes and a push as to encourage them to keep going and keep giving and keep believing in themselves and in what they can offer to themselves and to the world. Cham Chahda was born in Damascus, Syria in 1982. She received her BFA from Concordia University in Montreal, Canada, in 2016. Cham works predominantly in the medium of ceramics, but includes mixed media and different materials in her sculptures. She participated in many group exhibitions in Montreal, including juried shows at Galerie D’este, Art Mur Gallery, VAV Gallery and the Musée des Maîtres et Artisans du Quebec in Montreal. Her artwork was featured in the “Ceramics: Art & Participation Magazine” and “The Crafted Dish” that was launched for the National Clay Week in Canada. Cham Chahda currently lives and works in Montreal, Canada. I am obsessed with the subject of being “human”. My work is figurative sculpture, and takes its inspiration from the study of both physiology and body language. My figures always come with a narrative, where body gestures, facial expressions and interpretations of human form evoke an emotional response from the viewer. For the past five years my artwork was affected by the devastating situation in my homeland of Syria. During this period the figures I have been making expressed personal reflections on death, torture, starvation and displacement. The destruction of the Syrian country and the suffering of its people have become my drive for producing and making, in an attempt to release my spirit from the haunting images coming from my homeland. The last three years I developed an interest in working with mixed media. I produced a series of figures using found objects, porcelain, metal, glass, leather, hand-made paper, and steel wire. The quality of some of the materials that form parts of the figures, for example the delicateness of Japanese paper and the transparency of glass, serve as a reference to the fragility of our bodies and the very nature of human existence. Rana Hatmal’s experience as an architect influences the construction and design of her art. Her use of space is minimalistic yet sufficient to express the richness of her inspirations. As a result, her work juxtaposes complementarity and contrast between the subjects depicted and the colors used. This duality originates in the older religions of the Orient and is part of the DNA of those who preceded us and continues through us. Despite the challenges and the changes that she is going through in her new life in Canada, she continues to believe that freedom is a choice that each of us could make. Duality, Freedom and Migration are key themes for Rana’s artwork. Rana has held solo exhibitions and has participated in several group shows in Damascus, Beirut, Paris, Toronto and Montreal. My current project deals with one overriding theme, namely “hope”, and specifically hope for and of liberty, as reflected by two symbolic elements. The first element is represented by the extremities—feet and hands—with their free-flowing movements, compounded in different interlaced compositions marked by spontaneity, in one hand; while the birds represent the second element, that of free movement. Both elements converge in their symbolic meaning, and their representation of motion. The drawings employ the acrylic on canvas technique. I have, however, added a different medium in one of them, with the aim of creating a relief-type of raised surface on the canvas. This helps highlight the contrast between the black and white, while simultaneously displaying the harmony between the two basic elements—the feet and the birds.